A few days ago, daughter and I had a blast mall hopping. We also attended the Trade Fair showcasing products from Bicol. Got myself a miniature belen made from buri and some boxes made from abaca leaves. Of course, mall hopping won't be complete without some food discovery. 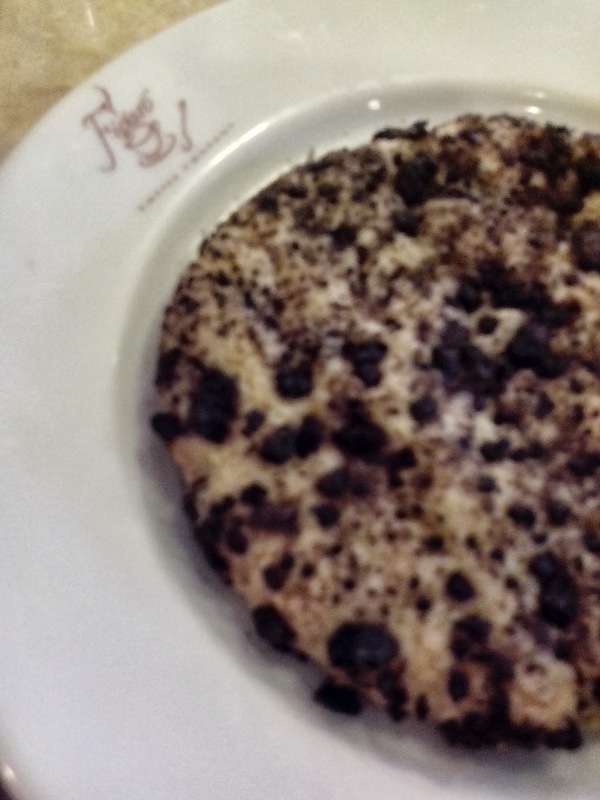 Figaro's Oreo Cheesecake Cookie. What a mouthful- but so delish! I love that its sweet, sugary and cheesecake-y at the same time. Cost P62 for this big piece of love. I want some milk with my cookie! Daughter opted to play safe and ordered two chocolate muffins- yum yum! Gavino's. I've seen Gavino's a couple of times in the past but it was only a few days ago that we bought some. Actually, their donuts reminds me greatly of Pon de Ring. We're supposed to get the donuts but saw these babies and bought them instead. Its mochi-donuts. You know, the hole-y part of the donuts. Got three flavors: Chocolate Hazelnut, Double Chocolate and Red Velvet. Daughter was the one who chose Red Velvet since its her current food addiction- red velvet cake, red velvet cupcake, and now, red velvet mochi. Hahaha. What's next, red velvet cape or dress? Halloween! Anyways, the chocolate flavored mochis are good and chewy. Btw, Japanese donuts are chewy because they use a different type of flour. Also, donut mochi is different from a real mochi, okay? But the clear winner in the mochi flavors is the red velvet. Wow, so happy that daughter is red velvet-crazy. I love that it tasted like red velvet-y chewy and complete with the cheese-y frosting on top. Definitely going back to Gavino's to hoard red velvet mochis. And not only that, the mochis only cost P15 each. Coolness.